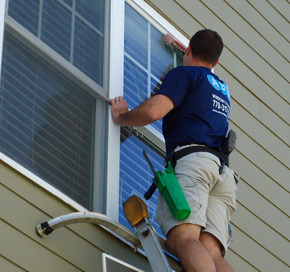 Whether you like to have a regularly scheduled window cleaning service or just need a one time cleaning for a special event, ABI Window Cleaning makes invisibly clean windows a very affordable home improvement. We hand clean every window by applying a safe, non-toxic, biodegradable solution. 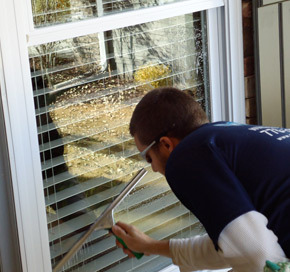 A scraper is used on any paint or debris and a squeegee is used to dry the window. The edges and seals are cleaned. Inside - Shoes are removed, floors under each window are covered and any property in front of the window is moved or covered. Outside - Protective padding is used on our ladders to protect your property and care is taken not to damage your landscaping. Our courteous and experienced workers are covered by liability insurance and workers compensation and undergo a back-ground check for you peace of mind. We are very efficient so that we do not take up your entire day, but we pay great attention to detail and never cut corners on a job. Pricing for window cleaning is determined by window type and number of windows and can be given over the phone or via email. As with any other service that we offer, we stand by our work and have a 100% satisfaction guarantee. Contact us today to get started.